Are you a self-proclaimed geek? Even if you keep your geeky side under wraps most of the time, you'll want to check out the ThinkGeek website, which is the ultimate source of all the items that a geek goes crazy for. Advertise your geek pride by purchasing one of ThinkGeek's shirts with clever phrases and pictures. You can also purchase sweatshirts, ties, hats, and jewelry to add to your geek-related attire. To really announce your geekiness, consider buying a Star Trek bathrobe, Star Wars bathrobe, Monty Python killer rabbit slippers, or zombie slippers and hat. With the wide array of apparel offered at ThinkGeek's website, you'll have fun sporting your geekiness. Since we all have a little bit of geekiness, even if it be deep down, ThinkGeek offers a wide range of products meaning you're sure to find items that speak to your inner (or outer) geekiness. For example, the company offers various edible products, such as bacon-flavored croutons, bacon salt, canned unicorn meat, and wasabi gumballs. Some of these products you'll be tempted to buy just to use as humorous office decor. 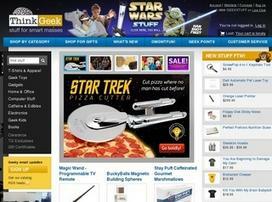 Of course, you're probably interested in learning what type of geek gadgets are sold at ThinkGeek. Well, you certainly won't be disappointed. You'll find car gadgets, laser pointers, cell phone accessories, watches, ecofriendly items, and tools such as a titanium spork. The security and spy category is also sure to be a crowd pleaser. Choose from rear view spy sunglasses, night vision binoculars, a disappearing ink pen, and many other items you always dreamed about having while you were growing up. As you'll learn by visiting the ThinkGeek website, the company perfectly understands geeks and offers products that appeal to the basic geek instinct. So whether you have been dying for astronaut ice cream or know someone else who is, look no further than ThinkGeek. Warning: You'll likely end up getting a lot of laughs from browsing through the great products...and will likely end up purchasing more than just the ice cream. Share what you think about ThinkGeek, and your favorite ways to save there! I enjoy thinkgeek because it has items from a bunch of websites and games I go to. Plus, its easy to get a gift card to one place, then have to ask for a bunch of different gift codes. I think ThinkGeek is a pretty awesome sight with a lot of variety in what is offered.